Discussion in 'Works In Progress & Finished Artworks!' 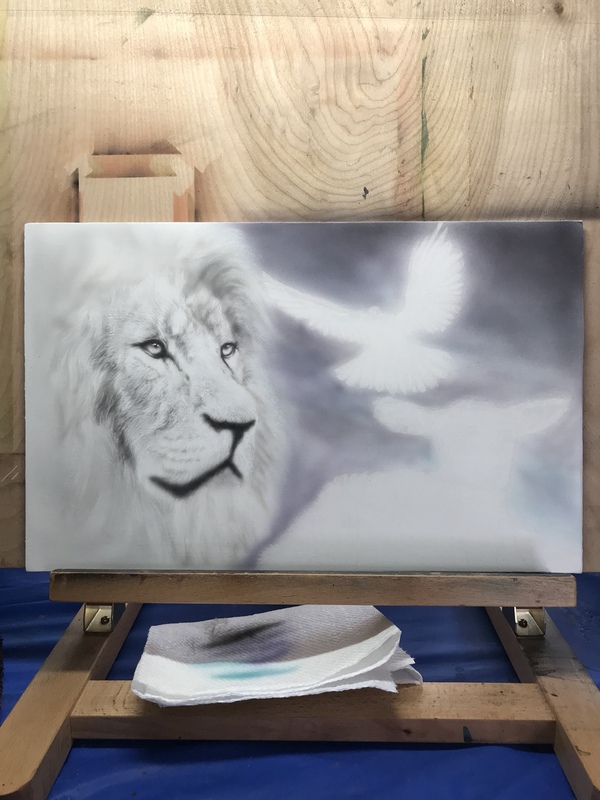 started by Airbrush Dreams, Dec 13, 2017. Ricky Spanish, Arent Jack, basepaint and 6 others like this. looking good, how did you apply the clay? I have been painting it with a sponge primer brush. I need to get a soft bristled gesso brush. Money is very tight right now. Just had a $500 dollar car repair and my Cocker Spaniel just ruptured her CCL ligament and tore her meniscus in her left hind leg. $273 emergency vet visit and now she is on two pain killers. Any supplies will have to wait. That’s one of the reasons I was selling my HVLP gun. The fur looks so soft Fred. Such great texture. Ricky Spanish, Arent Jack, SiRoxx and 5 others like this. much more done. I am working this piece as a whole to keep continuity. Iwata CM-SB, E’tac EFX on homemade clayboard 8 3/4”x 13 1/2”. Strange size but it was just a scrap piece to test my clay. Ricky Spanish, Arent Jack, basepaint and 4 others like this. Very nicely done Fred. Really like how it's looking at this stage. 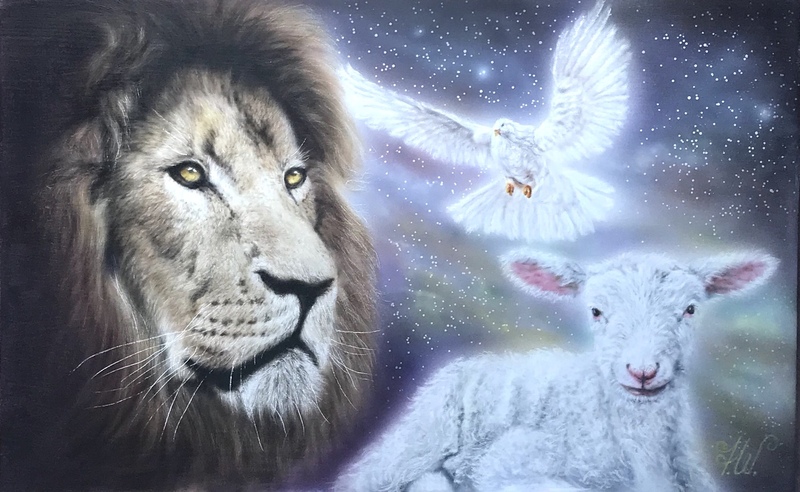 Lion of Judah, God the Father is done. 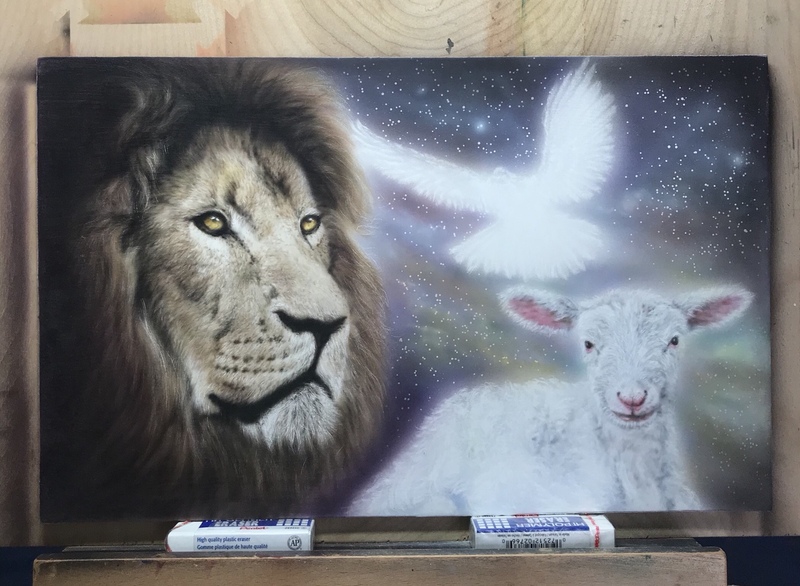 Now to move on to the Lamb Of God and God the Spirit. Iwata CM-SB, E’tac EFX on homemade clayboard 8 3/4”x 13 1/2”. Strange size but it was just a scrap piece to test my clay mix. Ricky Spanish, Arent Jack, NEMOPa and 3 others like this. RichardH Mac-Valve Maestro! Very Likeable! Excellent Fred. Looks like your liking the clay board and it seems to be working for you. Definitely love working the clayboard with E’tac. Sad thing is I have been painting so much my paint is dwindling down. I have plenty to get me by for a while but not another year. Got a long way to go on this one. Funny thing is I was just playing around with an oddball sized pice of cutoff board. musicmacd and SiRoxx like this. I am going to have to try the clay board mix. Only problem is I have to get my painting better to justify using it. I feel I have improved from when I started back this year but still long way to go to satisfy me. It is step by step. Each time you paint you gather a greater understanding of how and what to do. 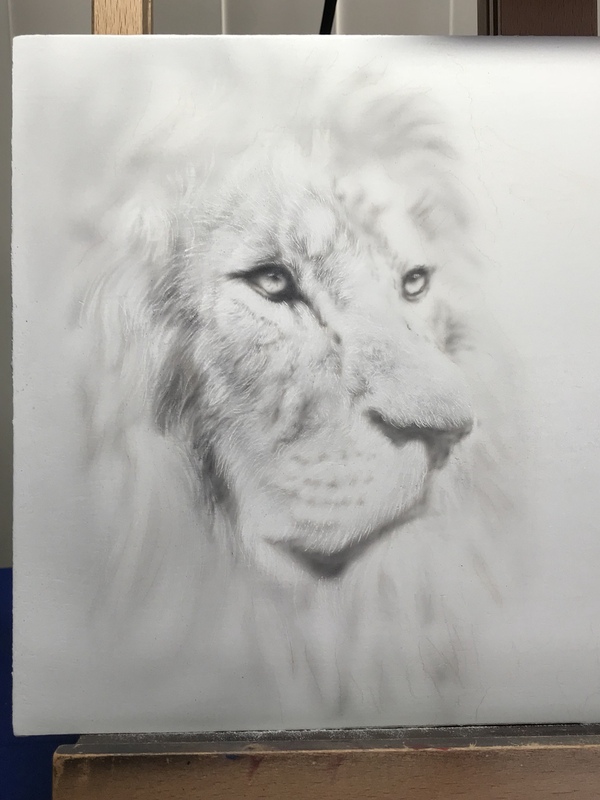 I am sure you will do well being on here with all the great artist to learn from. I know the feeling. It’s been a tough December. Between the car needing an expensive repair and my dog tearing her CCL ligament and meniscus and needing an emergency visit to a urgent care vet last Sunday. Not to mention the refrigerator dying last month. But I have faith all things will work out. All Done! Iwata CM-SB, E’tac EFX on homemade clayboard 8 3/4”x 13 1/2”. Strange size but it was just a scrap piece to test my clay mix. SiRoxx, Oxygen, doc1 and 2 others like this. Excellent work Fred. The photo of it i'm sure doesn't give it justice from looking at it up close. The clay board is working good for you.